As the kitchen and cooking techniques evolved through the ages, and cooking information was handed down from one generation to the next, recipes went through enormous changes. In the case of the macaroon, almonds were pounded to a finer consistency and then when sugar and vanilla entered the epicurean scene, they were used to sweeten and enhance these versatile tidbits of food. And as recipes traveled from country to country they were frequently altered, often as a result of what the cook had in the pantry or what was native to the area. For instance, other nuts were used when the almonds were not available. And, in Scotland, for example, shredded raw potatoes were used instead of nuts. Historians believe that Italian monks, seeking refuge during a periodic religious suppression in the 9th century brought the first macaroon to France. 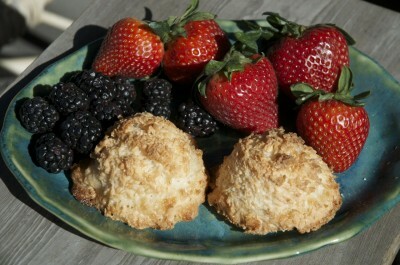 This original macaroon was a rustic cookie with a crisp outside and a chewy center. A form of this ancient cookie exists today and is called the Italian Almond Cookie. Then in 1533 the recipe for macaroons was transported to France by the personal chef of Catherine de Medici, who brought her chef and her sweet tooth indulgence with her when she married King Henri II. At this point the macaroon began to diverge from the rustic cookie and evolved into a refined, dainty and more elegant cookie. The macaroon in this more refined state was not eaten by the masses but was enjoyed by either sequestered monks or in the palaces of royalty. Then in 1793 two Benedictine nuns, Sister Marguerite and Marie-Elizabeth, traveled to the town of Nancy in Northern France seeking asylum during the French Revolution, and were believed to have popularized these sweets. They baked macaroons and sold them on the streets to pay for their keep with the local doctor who had given them shelter. The cookies became so popular that the nuns were known as The Sisters of Macaroons. Because the macaroon uses no flour or leavening, in the early 1800s Italian Jews adopted these cookies to be included in meals during the seven days of Passover. In time these treats were enjoyed throughout the year and eventually coconut was added to the ground almonds, and in many recipes, replaced them. Today chocolate bits might be added to the coconut and frequently the chewy morsels are dipped in melted chocolate. In the 1930s the son of the owner of Laduree, a very fancy French patisserie founded in 1862, invented the macaron (and in France it is spelled with only one ‘o’)sandwich. By then almond flour had become available and the macaroon morphed into an even more refined cookie than the one’s that had been developed by Catherine de Medici’s chef. These sweet treats had a classically smoothed dome top with a crinkled ruffle around the edge, called a foot in baking terms, and is filled with ganache or berry jam. Today Laduree’s macarons are considered the best of the best and are shipped all over the world with each macaron costing from $2 to $3 each. I have included recipes for the three different cookies. I must admit that I have not yet baked the fancy sandwiched macaroon. It’s a bit too fussy for my temperament because I do not have the patience for all the needed preparations. Line cookie sheet with a silicone-baking mat. Beat egg whites in the bowl until whites are foamy, beat in white sugar and continue beating until egg whites are glossy, fluffy and hold a soft peak. Sift together confectioner’s sugar and finely ground almonds in a separate bowl and then quickly fold the almond sugar mixture into the egg whites, about 30 to 35 strokes. Spoon a small amount of batter into a plastic bag with a small corner cut off and pipe a test disk of Batter, about 1 ½ in diameter, onto prepared baking sheet. If the disk of batter holds a peak instead of flattening immediately, gently fold the batter a few more times and retest. When batter is mixed enough to flatten immediately into an even disk, spoon batter into a pastry bag fitted with a plain round tip. Pipe the batter onto the baking sheet in small round disk shapes, leaving about 1 ½ to 2 inches between the disks. Let the piped cookies stand out at room temperature until they form a hard skin on top, about an hour. Preheat over to 285 degrees F.
Bake cookies until set but not browned, about 10 minutes. Let cookies cool completely before filling. When cookies are cooled, gently spread a light smear of your favorite jam on the bottom of one cookie and place another cookie atop of the jam. In a food processor combine 2 ¼ cup almonds and 1/3 cup sugar and process until mixture is finely ground, scrape down the sides several time, and then set aside. With an electric mixer beat egg whites and salt at high speed until soft peaks form. Reduce speed and gradually sprinkle in the remaining 1/3 cup of sugar. Turn speed up again and beat until mixture becomes stiff, shiny and peaks form. Add the vanilla, almond extract and ground almonds to the egg whites and gently fold together. Roll mixture into 1-inch balls and place 2-inches apart on backing sheet, flattening slightly. Top each cookie with an almond. Bake about 20 to 25 minutes or until cookies are golden brown. Cool for 5 minutes then transfer to a rack to cool completely. Mix together the shredded coconut, condensed milk and vanilla. Set aside. Add the pinch of salt to the egg whites and beat until stiff and shiny. Gently fold the coconut mixture into the stiffly beaten egg whites. Using a tablespoon dollop the cookie mixture onto a parchment lined baking sheet. Cooking time will be from 25 to 30 minutes. 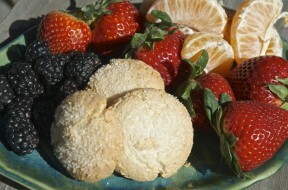 For more food articles and recipes check out KRL’s Food Fun section. Looks great and ‘gluten free’ at that. A must try. I love to read about the history of food. Great job. Yes, food history is always interesting. Thanks for stopping by and leaving a comment. Thank you for the history lesson. Always nice to learn a little something new. Now that I’m a grown up I like history more than when I was in school. Yes, Sharon it is always fun to learn a little something new. Thanks for stopping by! Nice article. 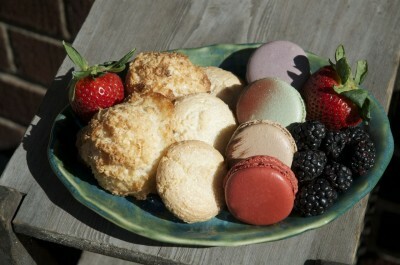 Love the history lesson and enjoy eating Macaroons once a year at Passover! But, they are not my favorite treat, brownies still hold the top award. Yes, Carol, I agree that a brownie is a hard act to follow. Glad you enjoyed the bit of culinary history and thanks for stopping by and leaving a comment. Hi Rose. Thanks for stopping by and I’m glad that you enjoyed the article. 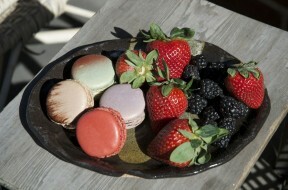 Who knew that the macaroon had such a diverse history. Thanks for this article! Very interesting. I always say cookies are good for your health, anyways! You are right there, Alicia!! Cookies make you stronger, smarter and prettier! And they pack so nicely in a pocketbook. Always great to hear from you!! The story was tooooooo sweet. I discovered the macaron sandwich cookie a few years ago and I never turned back. I do prefer it with chocolate ganache . . . but I prefer chocolate with anything. I had no idea the history was so long and complicated. Thanks for informing me about one of my favorite sweets. Hi Jeri, Yeah, chocolate ganache is really the way to go with a macaron. And I have a strong hunch that many foods that we take for granted have interesting and diverse histories. Thanks for stopping by and leaving a comment.